Seriously where do the days go? I can’t seem to get caught up with everything and then I think about our little arrival showing in a couple months….I’m even more freaked out! How am I go to be a full-time working mom with 2 kids?!?!? I know…there’s other moms that do it but this is going to be huge change for us. There’s going to be 5 years difference between my two kids (I’m still getting used to saying that!) and I feel like I’m going to be a new mom all over again. Just a couple deep breaths and I’ll be ok! Oh I forgot to mention….we’re having a BOY! So another new challenge for us. EEK! Now onto the food. I’ve been making a lot of soups this winter and this was probably my most favorite so far. My daughter gobbled up 2 bowls and asked for it to take to lunch the next day. I’d say that’s a success! 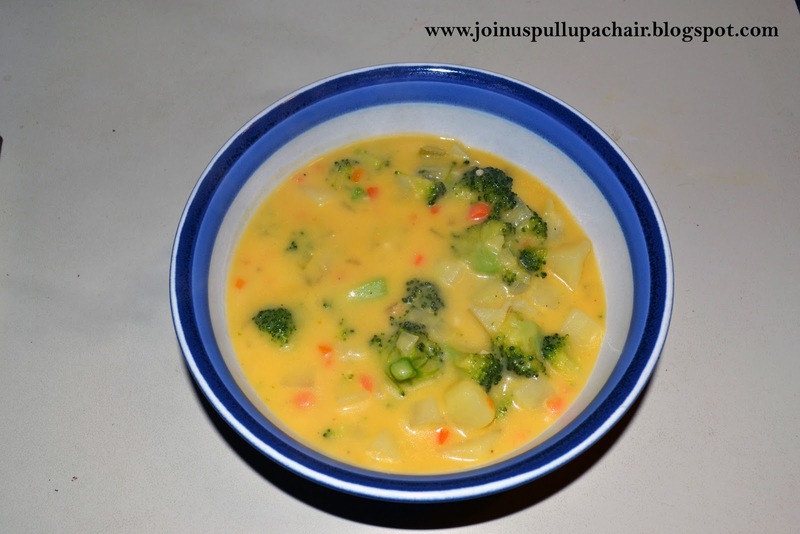 This soup is perfect – chocked full of veggies and then surrounded with cheddar cheese. In a large stock pot, melt the butter. Add the onions, carrots and celery. Saute over medium heat until tender. Add the miced garlic and cook for another 1-2 minutes. Add the chicken broth and potatoes. Bring to a boil and cook until the potatoes are just starting to get tender. In a bowl, mix together the water and flour until combined well. Add the to the soup and simmer until it starts to slightly thicken. Add the milk and broccoli and cook until the broccoli is tender and the soup is heated through. Stir in the cheese and allow to melt. Season with salt and peper. Serve in big bowls with a side of crusty bread. YUM!